the bride and Groom, decided that as an accompaniment to the dance they will have live music, face with several problems, the solution of which depends on how successful will be their first joint official dance. And the first of these problems is, of course, timing. If before the hour "x" just a few days, then you can not make it, not only with dance, but with live music, as the musicians who play at weddings, usually have a tight schedule with scheduled ahead for a few weeks or months of performances. Most couples prefer to put the dance yourself, based on their skills and capabilities. 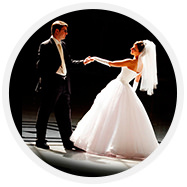 Some are turning to professional choreographers or wedding Agency. Anyway, but before you start joint rehearsals with the musicians, the dance is necessary to think and learn. Only after all these points are settled, it is important to choose the right music for the dance. As a rule, dance is designed for the specific arrangements, therefore, need music or a song already known in advance. However not always it is in the repertoire of the selected music group. Usually in this case, musicians practice the desired music or song. so, the future newlyweds have come up with and rehearsed the dance, chose a music group with suitable repertoire and agreed on the date of the celebration. Now be sure to hold several rehearsals. If the musicians know need for accompaniment wedding dance music and the dance itself is simple and well studied, it is usually all sufficient one rehearsal. However, in some cases, the rehearsal must be repeated. For example, if before the wedding a long time for a day or two before the official date is still one rehearsal needs to be done.